The man's condition is called unilateral dermatoheliosis and the man's skin has been gradually thickening over the past 25 years. 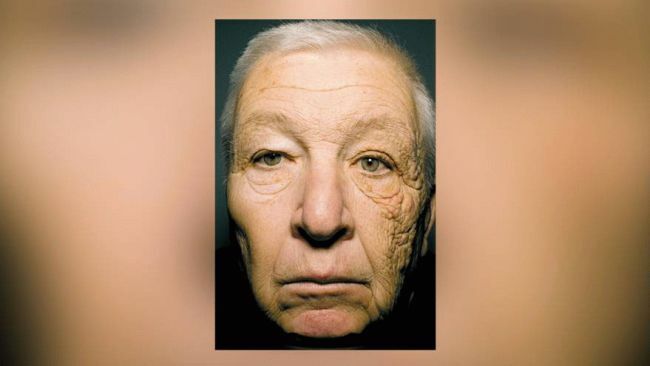 He was a long distance truck driver - one side of his face was more exposed to UV damage. UVA rays transmit through clouds and window glass to penetrate the skin's layers, and have been tied to aging and wrinkles. According to medical journals, chronic UVA exposure can result in thickening of the skin's top layers, the epidermis and stratum corneum, as well as destruction of the skin's elastic fibers. The truck driver took the brunt of the damage on the left side of his face because of his many hours behind the wheel. Experts had thought only ultraviolet B radiation (UVB), which cause sunburn, were the main cause of skin cancer but recent research suggests UVA rays can damage DNA in the skin's deepest layers, damaging collagen and increasing the risk of cancer. Doctors eventually recommended sun protection to this man , vitamin A creams called topical retinoids and frequent screenings for skin cancer. To protect yourself against UV radiation - use an antioxidant plus a good quality broad spectrum SPF every day 365 days of the year, seek shade, especially during midday hours, wear protective clothing, wear a hat with a wide brim to shade the face and head and use sun screen that protects against both UVA and UVB rays.